Unless you know exactly what you’re looking for, choosing a web developer in Las Vegas can be a difficult task. There are no licensing requirements for web developers and the barriers for entry are almost nonexistent. This has caused the web development market to become flooded with freelancers and companies of all skill levels, experience and capabilities. In this article, we’ll give you five tips for finding the perfect Las Vegas web development company for your next project. Many web developers claim that they can do it all. In reality, most web developers are primarily either graphic designers or programmers. Both of these fields are very specialized, and it’s uncommon to find people who are experts in both. When looking for a web developer in Las Vegas, we suggest asking them who will be doing the graphics and who will be providing the programming work. If it’s the same person doing both pieces, we advise paying even closer attention to their previous work and their portfolio. A web developer’s portfolio is a good indication of the type of work you can expect from them for your own website. When reviewing their portfolio, keep an eye out for aspects that you want to be incorporated into your website. If you are looking for the latest in design trends or cutting-edge technology, look for those types of designs in their portfolio. On the other hand, if you’re looking to have a website developed that involves complex programming, ensure the developer has examples of this as well. Will their website be SEO friendly? In the early days of the internet, simply having a website was enough to be found by both current and potential customers. In 2016, having a website is just one aspect of your overall web presence. It’s important to make sure that the web developer will create the site with SEO (search engine optimization) in mind. This will help you increase your rankings in search engines and make it easier for customers to find you. Another thing you should consider when choosing a web developer in Las Vegas is the scope of ongoing maintenance and the charges this will incur. It’s also important to understand at what point your initial projects ends and the maintenance phase of your relationship begins. Once you’ve narrowed your web developer choices down, it’s a good idea to speak with the developer directly. This will help you understand how well they communicate and it’s a good indication of how they manage client relationships. It’s also one last measure of safety before you have the developer begin working on your project. All in Web Pro is the premier web design and development company in the Las Vegas area. We focus on providing custom web design and development solutions to the Las Vegas area and beyond. Whether your project is a blog or business website, we can take your web presence to the next level. The thing is, that even if something is simple for a designer to handle it has taken years for them to learn that skill much like a doctor or attorney. Additionally, things can require custom development during construction which may necessitate additional time to either create or troubleshoot a unique component. Generally the more custom features, graphics, functionality, and components you request that are unique to your site the more it will likely cost. Yes, you can get a website for $150. No, it won’t be the same quality as a website that costs $1500. It’s like the difference between a bicycle and a Lexus. Both will get you where you need to go, but one is decidedly faster, provides a more comfortable user experience, and requires less effort for a user to operate than the other. Designers who charge more are typically providing you with expertise you won’t find at a bargain rate – and in most cases, the value of the benefits will certainly outweigh the added costs. If you automatically choose the cheapest option, you risk hiring a designer who may have poor communication, an unclear process, inconsistent follow-through, no support after completion, or a sub-par or faulty end product. Don’t say we didn’t warn you! This goes for the same as using a build-it-yourself site like Wix or SquareSpace. You can get a nice looking site but you may end up spending a hundred hours to do it and have a website that is missing important elements or that is not organized, modern, or user-friendly. In the interest of being honest, I’ll share a tidbit that can add to the cost of a website. If you as a client are not organized in advance and don’t have your project information like initial vision or revision request organized, succinct, and collected into one easy to read document, it will most likely slow down communication, require extra time to be spent in follow-up conversations to clarify your feedback, and will take time away from both yourself and the company you hired, ultimately delaying the final completion date of the project and potentially costing you more money. Over time, designers learn how to identify challenging clients, and although we take many precautions to ensure our design & development processes are clear and straightforward, we also make sure that we are compensated for any extra work caused because of a highly demanding client. Please remember that designers also have lives away from our computers a healthy long lasting business to business relationship works both ways. Like lawyers, depending on the project, graphic designers and web developers have the ability to bill clients for time spent on rushed projects that require work outside of regular work hours, or even for time needed to meet, call, or email with a client depending on the type of project and service agreement in place. As a client the best thing you can do is allow your designer the time he or she needs to complete the list of work they currently have and not make edits in the middle of a project, especially if it isn’t going to be finalized yet. Also, it’s extremely important to follow the procedural instructions of your designer or developer. If they require all revisions or information to be submitted at that time, it’s important to spend the time necessary to have your information prepared so that no surprise changes need to be made near the end of the project that should have been brought up in the beginning. Good Question. A good website on the low end will probably cost anywhere between $3,000 and $5,000. This is a very rough estimate for basic but good quality informational website for a business. From there the cost can go up depending on how many additional features, components, custom work, or special considerations you are requesting. If you are looking to only spend $2,000 or less, you may as well just use a do-it-yourself web editor, or use a creative solution such as forwarding your domain name to a simple business listing page like your Google Places or facebook page until you have enough time and money to invest in a professionally built website. For another rough estimate of web design costs, feel free to use this web design pricing calculator for a general example of how prices change as more features are added to a website quote. Interested in getting some web development done? Contact our team at All in Web Pro today! You’ve decided to get a website. Terrific! You may be asking yourself “now what?”. It can be tempting to jump right into choosing a template or design you like and running full steam into the development process. Although this is tempting there are proven steps that will help your website development process go easier. These five steps will ensure you have a final product you can be proud of and that accurately represents your company or organization. Text (or web copy) is the backbone of your website. It can attract clients if presented the right way or it can scare them off when it lacks focus or has typos. Paying close attention to what you write and how you write it can make a huge difference. Think of an average reader, then use clear and accessible language in your writing so that everyone can understand it easily. Write the content for your pages before you contact a web developer. By writing and re-writing your content you will be able to determine exactly how you want people to see your business before any design is ever done. If you haven’t yet chosen a name for your company, think about what your URL will look like. You don’t want a website that reads "joesfunkyandawesomeshirts.com". Short, clear names are easier to understand and look great online. Choose a name that is simple and short with a meaning that you can brand and stick with. Stay away from picking a company name just because it has a keyword you want to target, instead go for branding and let the keywords take care of themselves. And if you’ve already chosen the name of your company, there are still several variations of the name of your company and for the domain extension you choose (.com, .co, .vegas) that can give you the best domain name and online brand possible. Once you have a name picked you will want to decide on colors for your brand and a logo. Having a designer create your logo is well worth the effort as that can make you look much more professional than if you were to create one on your own. Colors mean different things and talking to a designer can help you find a color scheme that works for your website and logo. Be careful to pick colors and designs that you can use for print advertising, vehicle wraps, letterhead, online media, etc. A business website requires different photos: photos of your products, a portrait photo for the ‘about’ or ‘bio’ section, an introductory photo for your home page, etc. Since we’re living in the age of images, you need to choose your images carefully and make sure they’re high-resolution and the best possible quality. Stock photos can work but if you have the ability, have custom photos taken by a professional photographer. Much like the logo your photos have the power to make your website stand out and impress visitors. This could very well be step 1, but researching is important through the entire stage of building a website. Look at competitors to see what you like and don’t like about their websites. Make lists of important pages, content, calls to action, and features that you want on your site. Ask other professionals in your field and your past clients what would like to see on your website. Getting input from trusted and relevant sources can be invaluable in the decisions you make about your website’s design. For help with your next web project contact us at All in Web Pro at 702-331-0650! User Experience, abbreviated as "UX", in web design and web development is not a new thing by any means. Ensuring that your user has an easy, attractive, and intuitive way to interact with your website and all of its functions is everything. UX encapsulates form interaction, information display, menus, and any other element that you can add to a website. The goal of having good UX is to give the user a pleasant and useful flow of interaction that is helpful and absent of any inconveniences or wasted moments or actions during their visit on your website. Improving usability, accessibility (screen readers, and the like), and creating a pleasurable experience for users interacting with your product is what good UX is all about. Things like stunning visuals, tasteful animations, and even elegant error messages can contribute to creating an overall positive user experience. However, it is often difficult for web and graphic designers to put themselves in the users' shoes, but luckily there is an easy way to get around that, using feedback and testing. When you are working on a project, don’t rely purely on what you think looks or "flows" nicely. Have a friend or relative try it out and see what they think. Having a fresh set of eyes on your work can help immensely with finding the points in your work that would otherwise be very difficult or impossible for you to find on your own. Get feedback from friends, family, A/B testing, page analysis tools, and anything else you can get your hands on. These are crucial for any high-end or high traffic web design project. Keep your design consistent. Reuse design elements to give a sense of unity. This means, stick to your colors and light/darkness percentages. Make tasteful use of animation. Tasteful is hard to define, and it is ultimately left up to you, but find an animation that works for you and the functions that your application performs. Smooth movement is great eye-candy, and will reinforce the feeling of completed an action or creating a sense of progress as users navigate through your site. Make use of load times, but keep them short. Having an animation or smooth transitions will reduce the perceived load time, and making things load quickly will help retain users and make sure that they do not get bored or impatient. Overall, making good decisions for your website's UX from the very start will make the rest of the process much smoother and easier for you as the designer and/or developer. Knowing how you want to notify users of actions, how you will apply changes to information dynamically, and how things like navigation are going to be laid out are really large steps that can help ensure your users have the best possible experience while interacting with the product and brand. If you’re a business owner or entrepreneur, finding the right web design company to build your website is a crucial decision. A well designed website can help drive sales or bring in more clients, while a poorly designed site can drive potential customers away and lead to lower conversion rates. In this short guide, we’ll cover the most important things to consider when choosing a web design company for your next project. The first, and quite possibly the most important step in choosing the right web design company for your business, is understanding your company’s bottom line or overall goal that you plan to achieve with your online presence. For example, if you are planning on opening an e-commerce website your main concerns would likely be return-on-investment (ROI) through conversion of sales and building a strong, loyal customer base perhaps through email address collection. On the other hand, if you we’re a new startup company your main focus would likely be on building brand awareness, and your website would reflect this by providing information and educational resources about your services or products. Once you understand the type of website needed to fit the unique goals of your company, it makes choosing a web design company much easier. You can then contact different web design companies to discuss your needs or view case studies provided by each web design company to understand how they’ve assisted clients in the past and the solutions they present for the unique user interaction goals and conversion method you’ve chosen to use to get users to take a desired action. Besides understanding what type of website your company needs, you must also understand how you can justify the costs of web design to ensure that you are receiving the value needed to meet your bottom line. Everyone has heard the term “you get what you pay for,” and it definitely applies to web design. However, it’s also important to understand that cutting costs now may lead to not getting back as much value from your website in the long-term and this may cause your business to fail to meet its bottom line. Before making your decision, ask the web design company if they’re able to provide evidence of the value delivered through their web designs. If the web design company is able to provide you with a website or service that will bring return on investment and help you meet your bottom line, then it’s a good value, no matter the cost. If you’re looking for a web design company in Las Vegas, look no further than All in Web Pro. We’ll ensure that you’re delivered a professional web design solution that will engage your audience and showcase the best you have to offer. Unless you know exactly what you’re looking for, choosing a web developer in Las Vegas can be a difficult task. There are no licensing requirements for web developers and the barriers for entry are almost nonexistent. This has caused the web development market to become flooded with freelancers and companies of all skill levels, skill types, experience, and capabilities. In this article, we’ll give you 5 tips for finding the perfect Las Vegas web development company for your next website project or advanced web application. Many web developers, (web dev&39;s) claim that they can do it all. In reality, most web developers are primarily either graphic designers, web designers, content specialists, or programmers. Each of these fields are very specialized, and it’s uncommon to find people who are experts in more than 1 or two of them. When looking for a web developer in Las Vegas, we suggest asking them who will be doing the graphics, where the text content will come from, who is setting up the website in the online CMS platform such as WordPress or SquareSpace, and who will be providing the programming or coding work if at all. If it’s the same person doing two or more of these things, we recommend paying close attention to their previous work in their portfolio and asking to see live examples of their work online that's actively being used by past clients of theirs. A web developer’s portfolio is a good indication of the type of work you can expect from them for your own website. When reviewing their portfolio, keep an eye out for aspects that you might want incorporated into your website. If you are looking for the latest in design trends or cutting-edge technology, look for those types of designs in their portfolio, or find them on other websites and ask them if they can build something similar. On the other hand, if you’re looking to have a website developed that involves complex programming, ensure the developer has examples of this as well and ask key questions about cost, timelines, and what to expect. In the early days of the internet, simply having a website was enough to be found by both current and potential customers. In 2016, having a website is just one aspect of your overall web presence. It’s important to make sure that the web developer will create the site in a way that makes it easy to perform SEO (search engine optimization) tasks, such as updating meta data, or that automatically incorporate search engine friendly tags on images, links, URL page addresses, and that link internally and externally appropriately. This will help you increase your rankings in search engines and make it easier for customers to find you, especially if you are going to be blogging, launching an SEO campaign, or hiring a separate company to do your SEO afterwards. Another thing you should consider when choosing a web developer in Las Vegas is the scope of ongoing maintenance and the charges the site will require and incur after initial development is complete. It’s also important to understand at what point your initial projects ends and the maintenance phase of your relationship begins. If your website id being developed in phases, having a clear roadmap and expectations for ongoing work is even more important. Once you’ve narrowed your web developer choices down, it’s a good idea to speak with the developer directly, and in person or on video if possible. This will help you understand how well they communicate, how well they understand your vision, if your get along well with them, and it’s a good indication of how well you can manage and maintain your positive working relationship when important and detailed communication is needed during your project. It’s also one last measure of safety before you invest in having the web developer begin working on your project. We don't ever recommend hiring someone who doesn't speak your native language, or who comes from a cultural background that is different than yours as this may dramatically change the way they interpret your instructions and vision for the project. All in Web Pro is a premier web design and web development company in the Las Vegas area. We focus on providing custom web design and development solutions to the Las Vegas area and beyond. 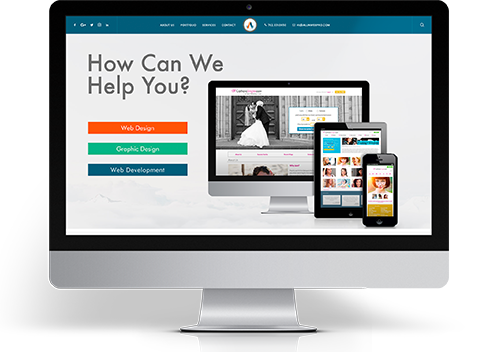 Whether your project is a blog, custom web application, or business website, we can take your web presence to the next level.